Thrifted Plaid Skirts first surfaced on Chictopia's streetstyle gallery in Fall 2009 seen on Brooklyn blogger Keiko_Lynn of keikolynn.com. She wore her black thrifted plaid skirt with a black modcloth weardrobe, modcloth dress, yellow vintage thrifted blouse, and black vintage thrifted belt. Since then, Thrifted Plaid Skirts have grown in popularity as bloggers from Port Orchard, Brooklyn, and Richmond have discovered them. 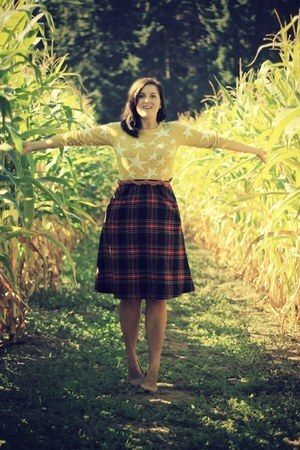 Thrifted Plaid Skirts are generally seen in preppy, vintage, and casual style. Popular types of Thrifted Skirts are plaid, polka dot, maxi, pleated, and floral. There are currently 42 streetstyle photos of bloggers wearing Thrifted Plaid Skirts. Most recently, blogger meggstatus of anotherdaytodressup.blogspot.com rocked her orange thrifted plaid skirt with a red vintage jacket, beige thrifted blouse, and brown Frye platform shoes.